Large thermal reactors with little flux coupling between regions may experience spatial power oscillations because of the non-uniform presence of xenon 135. Xenon-induced spatial power oscillations occur as a result of rapid perturbations to power distribution that cause the xenon and iodine distribution to be out of phase with the perturbed power distribution. This results in a shift in xenon and iodine distributions that causes the power distribution to change in an opposite direction from the initial perturbation. Xenon-135 is a product of U-235 fission and has a very large neutron capture cross section(about 2.6 x 106 barns). It also decays radioactively with a half-life of 9.1 hours. Little of the Xe-135 results directly from fission, but most comes from the decay chain, Te-135 (β– decay, 0.5 min) to I-135 (β– decay, 6.6 hr) to Xe-135. The instantaneous production rate of xenon-135 is dependent on the iodine-135 concentration and therefore on the local neutron flux history. On the other hand, the destruction rate of xenon-135 is dependent on the instantaneous local neutron flux. The combination of delayed generation and high neutron-capture cross section produces a diversity of impacts on nuclear reactor operation. The mechanism is described in the following four steps. An initial lack of symmetry (let say the axial symmetry in case of axial oscillations) in the core power distribution (for example as a result of significant control rods movement) causes an imbalance in fission rates within the reactor core, and therefore, in the iodine-135 buildup and the xenon-135 absorption. In the high-flux region, xenon-135 burnout allows the flux to increase further, while in the low-flux region, the increase in xenon-135 causes a further reduction in flux. The iodine concentration increases where the flux is high and decreases where the flux is low. This shift in the xenon distribution is such as to increase (decrease) the multiplication properties of the region in which the flux has increased (decreased), thus enhancing the flux tilt. As soon as the iodine-135 levels build up sufficiently, decay to xenon reverses the initial situation. Flux decreases in this area, and the former low-flux region increases in power. Repetition of these patterns can lead to xenon oscillations moving about the core with periods on the order of about 24 hours. With little change in overall power level, these oscillations can change significantly the local power levels. This oscillation may go unnoticed and reach dangerous local flux levels if only the total power of the core is monitored. Therefore most PWRs use tandem power range excore neutron detectors to monitor upper and lower halves of the core separately. 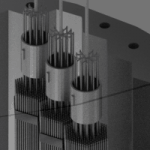 Spatial xenon oscillations are typical for power reactors, since they operate at higher neutron fluxes, in which the xenon burnup becomes a very strong component of the xenon 135 dynamics. 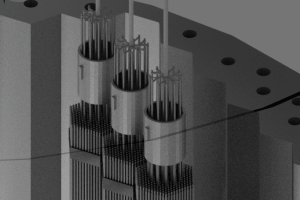 In order to sustain a significant xenon oscillation, the average thermal flux of the reactor should be greater than 1013 neutrons/cm-2.s-1 (typical PWR has about 3×1013 neutrons/cm-2.s-1). 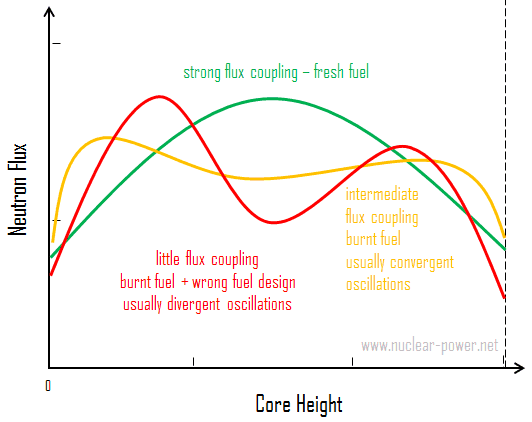 Together with the high flux, the reactor core should be large relative to the migration length such that the both halves of the core can be assumed to operate independently. Almost all PWRs meet these conditions. Consequently, they are vulnerable to xenon oscillations. 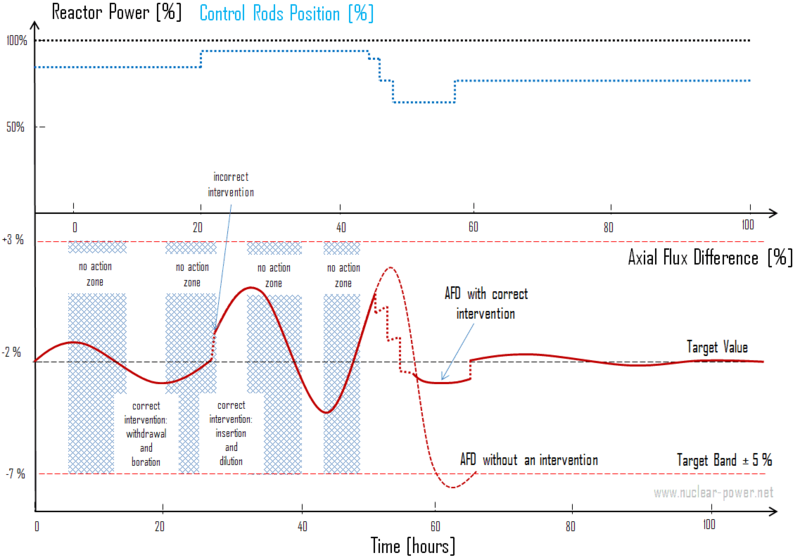 Both the radial and axial dimensions of a commercial reactor are large enough to sustain xenon oscillations, however, the axial oscillations are the ones of major concern in most cases. In a reactor system with strong negative temperature coefficients, the xenon 135 oscillations and with very high flux coupling are damped quite readily. This is one of reasons for designing reactors to have negative moderator temperature coefficients. Since this effect influences global power distribution in the core, it also influences local power distribution. The problem, however, is in the initial swing of flux levels which displace the flux upward. 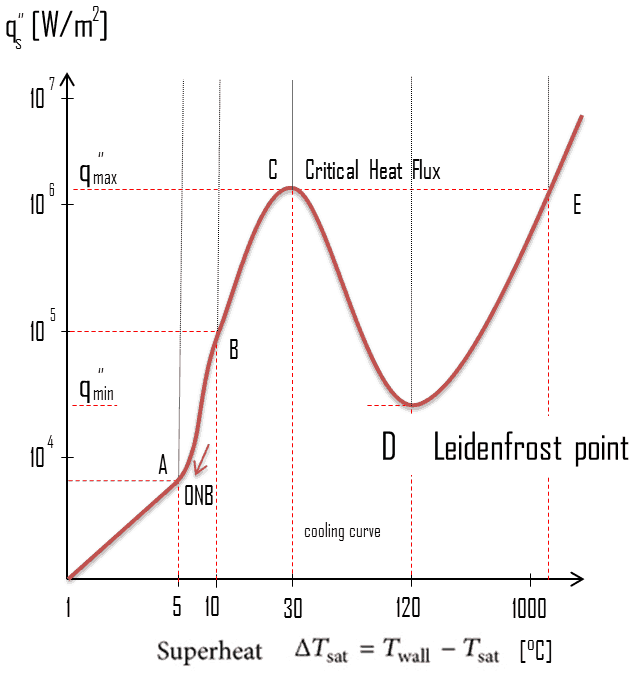 Since at the higher elevations the local linear heat rate (FQ(z) limit) is highly restrictive, large xenon spatial oscillations have to be minimized to prevent exceeding FQ limits. In order to control xenon spatial oscillations, the axial flux difference or the axial offset are introduced. The most important of these are the axial flux difference (AFD) limits. 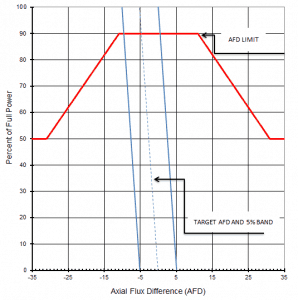 AFD is a measure of the imbalance between the upper and lower halves of the core in terms of power or flux (ΔI). 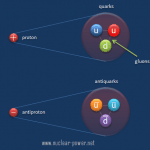 The AFD is determined from the outputs of the upper and lower excore neutron detectors, which belong to so called the excore nuclear instrumentation system (NIS). AFD is controlled by control rods. The control rod banks can be inserted into the core from the top and therefore, a control rod bank motion will result in a symmetric reactivity insertion in the core in the radial and azimuthal directions, but the reactivity insertion will not be symmetric in the axial direction. 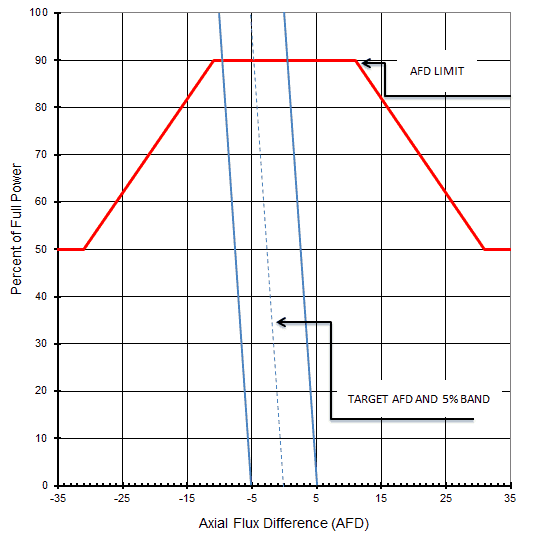 As a result, a control rod bank insertion causes a decrease in AFD since the power is shifted from the upper half to the lower half of the core. 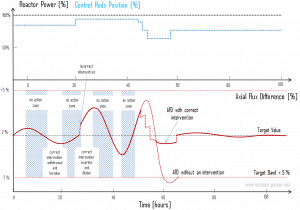 A proper intervention by control rods in proper time can lead to damp the oscillation. There are different control schemes based on the availability of control mechanisms. 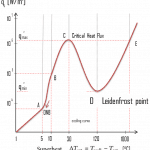 The most commonly used control mechanism of axial oscillations is based on Part Length Control Rods (PLCRs), which are moved around the central part of the core. A shift in AFD, either up or down, will then be controlled by moving the PLCRs in the proper direction. 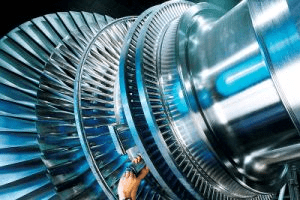 The rod control system automatically modulates the insertion of these control rods, which control the axial power distribution. These control rods are also called “grey” control rods. Grey control rods use a grey neutron absorber, which absorbs less neutrons than a “black” absorber. If there are no PLCRs, the control strategy will be completely different. 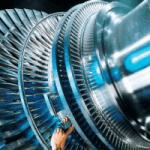 Additional control mechanisms are the inlet temperature, boron concentration in the reactor coolant, and positions of Full Length Control Rods. In any case, however, the strategy is quite simple and heuristic. The operator must respond to an oscillation with a sensible control action. The problem that must be solved is the quantification and the timing of this action. A method, which combines proper actions (insertion and withdrawal), is known as the Bang-Bang control. 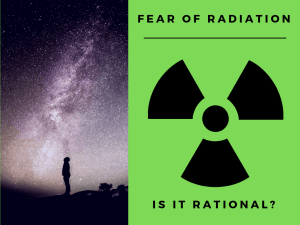 Continued operation with a significant spatial xenon oscillation could lead, at least, to a reactor trip or, more seriously, to dangerously high local fuel temperatures. Even without such severe consequences, xenon oscillations causes an unnecessary temperature cycling that could lead to premature materials failure.